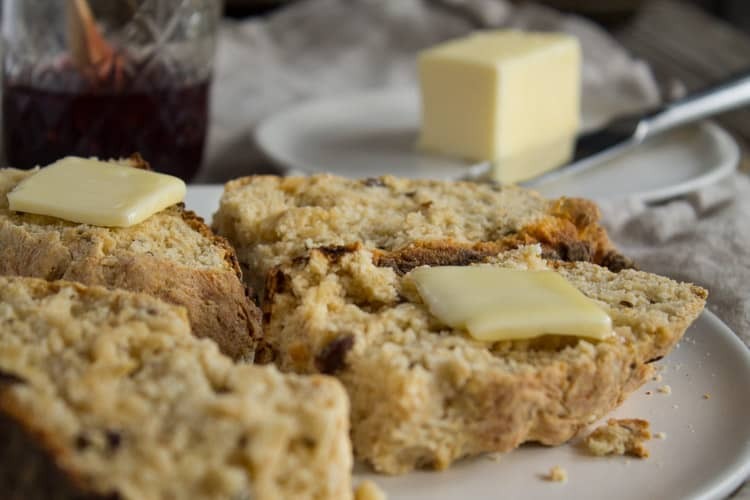 A St. Patrick’s Day classic, this Whole Wheat Irish Soda Bread replaces half the grains with whole grains and half the butter with Greek yogurt. Tastes as delicious as the original – you won’t know this version is better for you! I feel like I get the best of both worlds being Irish and Italian. I get the red sauce and the pasta, and the Guinness and the corned beed (in my case cabbage and turnips) and Irish soda bread! Pretty lucky, I know. Growing up, we used to get together every St. Patrick’s Day at my grandparents’ house and I have memories of playing Irish folk music and hanging out on the patio. Today, I try to continue the tradition of gathering loved ones on this holiday by making a big ol’ crockpot of corned beef and cabbage and inviting friends over for a Irish feast. Now any good Irish girl knows that St. Patty’s Day is not complete without Irish soda bread and every year I make the same soda bread recipe. But this year, I thought I’d change things up a bit and create a healthier version of the classic recipe. This recipe has got half whole grains! Can I get a heck yeahhh for fiber? It’s also got half the amount of butter originally called for and I replaced it with Greek yogurt (hello, protein!). I feel much better eating this version for breakfast alongside some hard boiled eggs knowing that I’m getting double the protein and some added fiber. Now that’s a breakfast with some serious staying power. Plus, it tastes as good as the original. By using white whole-wheat flour, you really can’t detect a taste difference. If anything, I think it tastes just a bit heartier. Whenever I make Irish soda bread, I always ask myself why I only make it once a year. It’s SO easy. This is one of those breads that doesn’t require you to rise-punch-rise and take 24 hours to make. 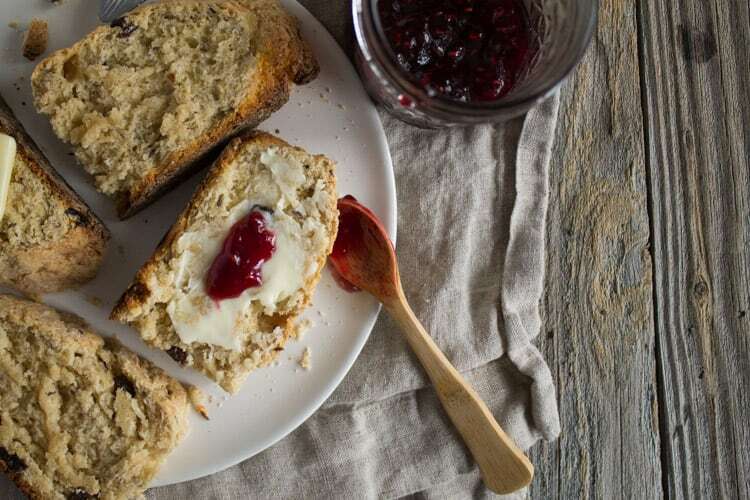 With Irish soda bread, there’s no yeast required. In fact, the bread rises by a chemical reaction between the baking soda and the acidic buttermilk. Melt 4 tbsp butter with buttermilk in a small sauce pan over medium-low heat. Set aside to cool. In a large mixing bowl, add flours, sugar, baking powder, baking soda, salt, caraway seeds, and raisins. Add the buttermilk/butter mixture to the dry ingredients and mix together. Fold the yogurt into the dough. Turn dough out onto lightly floured surface. Knead for 30-60 seconds and form into a round loaf. Lightly cut a cross in the top of the loaf with a serrated knife. Melt 1 tbsp butter and brush melted butter all over the loaf. Transfer loaf to a baking sheet and bake at 425 degrees F for 30-35 minutes or until golden brown. Let cool and Serve warm or at room temperature. This bread is delicious with just a spread of Irish butter and maybe a little homemade jam for good measure. 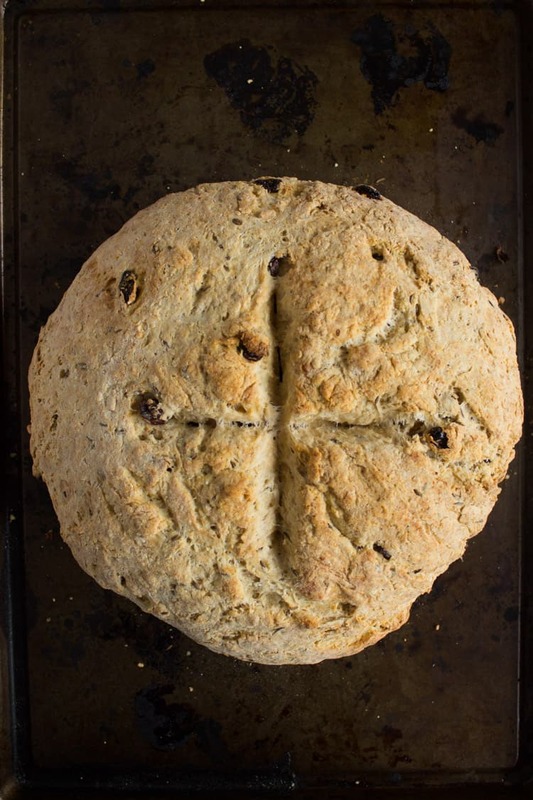 Tell me, do you make Irish soda bread for St. Patrick’s Day? Have you ever tried a whole-wheat version? 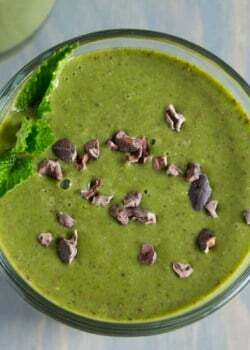 Try some of my other St. Paddy’s Day recipes! 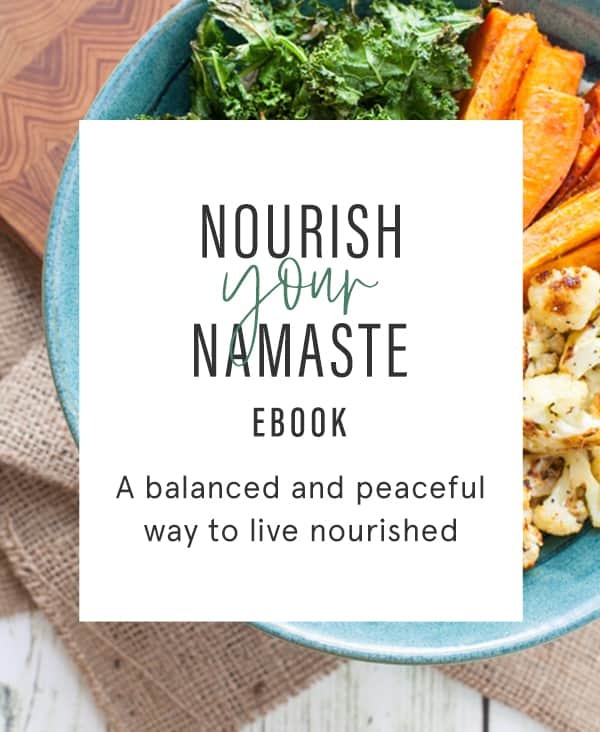 For more Instant Pot inspo’ check out my recipes below! I made this, with some modifications, and it came out great! I used 1/2 whole wheat flour and 1/2 quick cook oats. The texture was very dense (but still bready- not like a bagel), hearty, and moist- definitely not as light as a traditional soda bread, but still very yummy. I also left out the sugar- I made it to go with a savory dinner, and found that the raisins added enough sweetness for my taste. 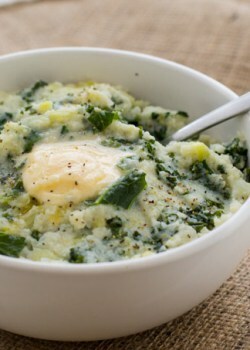 All this being said, I really enjoyed this recipe, will definitely make again! Would like to try this recipe. But how much is “g”? Don’t know these amounts. Hey Sue! So sorry but I don’t see “g” anywhere in the recipe. Can you let me know where you see that? 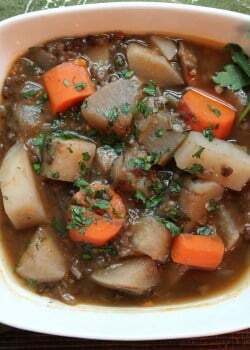 Where can I find the nutritional info fir this recipe? 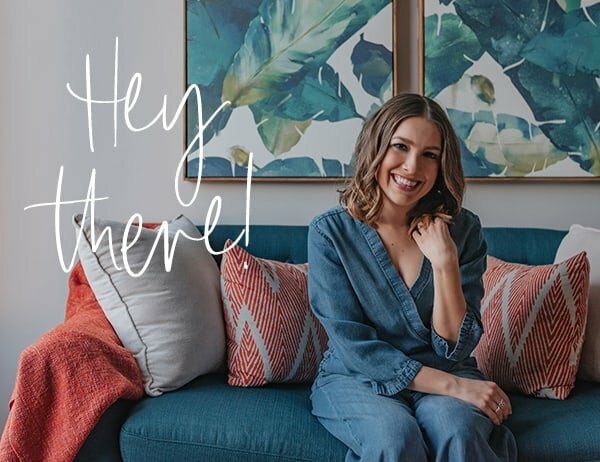 Hi, Jenine! 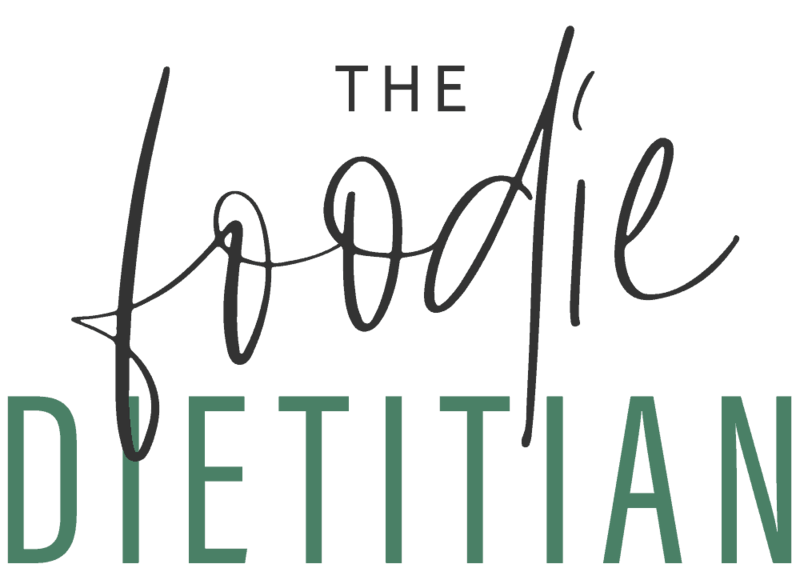 I don’t do nutritionals on any of my recipes because I’m not a big believer in counting calories or grams of this or that. Yum! This looks so good, I would love a piece right now! What a great recipe! Just pinned, my husband will LOVE this!! Look forward to trying this for St. Pat’s Day. Thanks for posting. Thanks, Matt! Hope you enjoy! Mmmmm – try serving with butter, jam and a little yogurt on top. I made this yesterday and it makes a beautiful loaf. It was moist and delicious. I used non fat Greek yogurt. 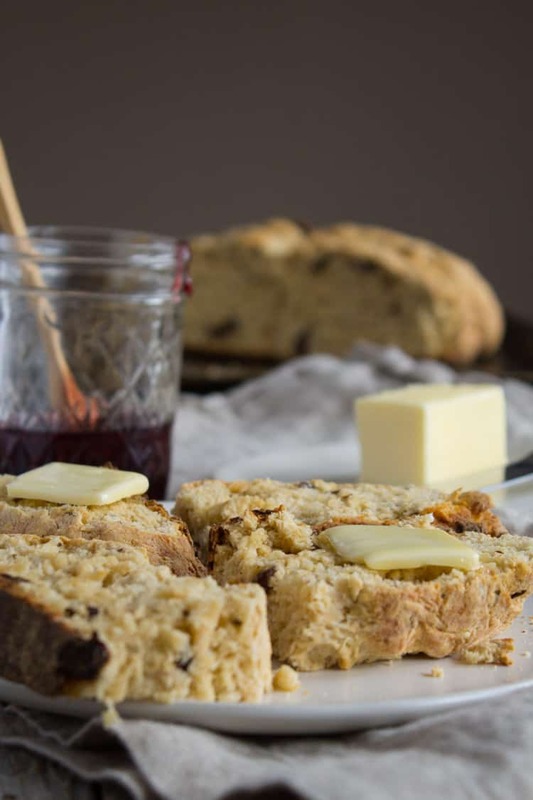 Thanks for this healthier option to make Irish soda bread. It was great with our corned beef and cabbage! Hey I tried this recipe today. I modified it a little by using all whole wheat flour, 1 tablespoon of honey instead of the sugar, whey instead of the buttermilk and an additional half cup of dried cranberries. I also made two loaves instead of one. It turned out pretty good. Thanks for posting! This recipe looks amazing, can’t wait to try! But before I do, can I sub plain non-fat Greek yogurt instead of the low-fat variety? Thanks, Maggie. I personally recommend sticking with the low-fat Greek yogurt since you’re eliminating a good amount of fat by swapping out the butter. But, I think you’d be fine using non fat yogurt if that’s your yogurt of choice. Oh goodness! I can almost taste this right through my laptop screen! What a gorgeous loaf! And love how you used Greek Yogurt. 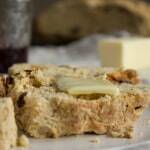 I have a soda bread recipe I’m trying on Friday, but am pinning to try this one soon after. Making the corned beef & cabbage too – love having it once a year just like we used to do in the Shea household! Happy St Paddy’s Day to you guys! 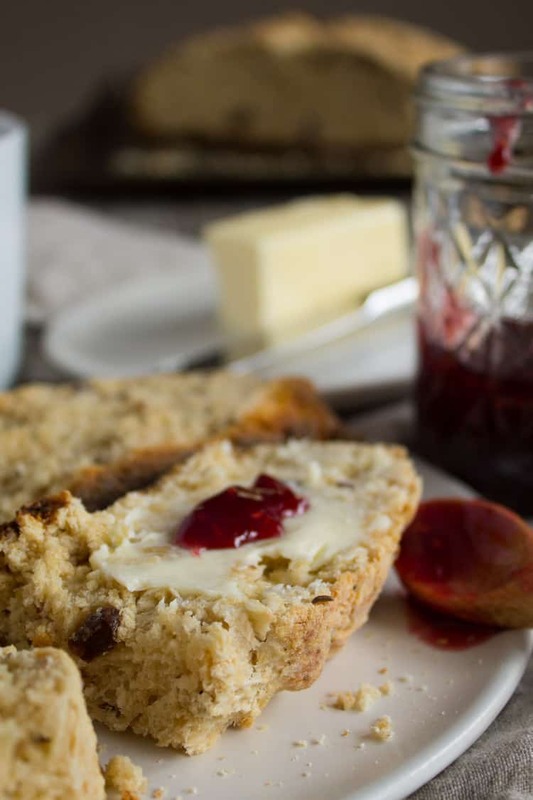 I love, love, love Irish Soda bread but have NEVER made it. Not once! As much as I love to cook, I’m not really a baker, I hate the idea of having to measure ingredients precisely 🙂 This whole wheat version looks great- maybe I’ll get into the kitchen this week and give it a shot for Saturday! Woot Woot! It’s ridiculously easy to make. So refreshing when you don’t feel like making a yeast bread that takes foreverrr. Enjoy! Let me know how it turns out if you end up making it.